You can bag chukar and every other bird I've ever hunted without a dog, but having a bird dog is a huge advantage. I didn't become an accomplished upland bird hunter until I got my first real gun dog. Aside from my boots and shotgun, my bird dog is my most valuable asset for hunting chukars. Just as important from my perspective, if not more so, is the enjoyment I have derived from hunting over my own dogs. I love to watch them work and it gives me great pride in their abilities which I have helped to develop. Barring tragedy, I will NEVER be without a hunting dog again. A few words of caution are in order as chukar country presents dangerous conditions for our canine friends. Rattlesnakes are a risk before they hole up for the winter. If you don't want to worry about slithering vermin or your dog likes to play with snakes, avoid the early season. Wait until it gets cold and the snakes hole up. That's what I do. Another option is to put your canine through snake avoidance training. This method is widely practiced by southwestern quail hunters and is being increasingly adopted by chukar hunters . In snake avoidance training, your gun dog, wearing an electronic collar, is introduced to a defanged rattlesnake. If your best friend shows interest in the venomous Crotalus, the trainer gives him a zap. The encounter continues until your dog won't have anything to do with the rattler. The method may seem a bit harsh, but an uncontrolled encounter with a rattlesnake in chukar country, like the potent Mojave Green, could cost your dog's life. Be sure that you carry a generous supply of water for both of you. This is especially important in the early season. If there isn't water available for your dog, he'll drink more of yours than you do. I like to carry a canvas water dish. I don't put much in it at a time because I don't want to waste anything as precious as water. Others use a double zip-lock bag as a combination water dish-canteen. It sounds promising but I have yet to try this technique. I strongly recommend booties for your dog's feet, especially when hunting for more than a day or two. I, like others, have yet to find a set that I'm satisfied with though. 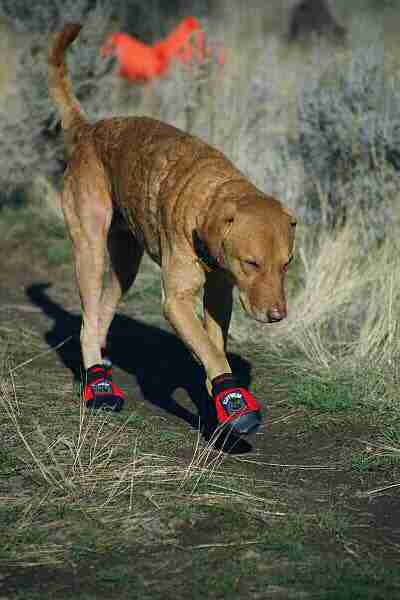 Rubber dog boots can be an ordeal to put on, but may provide the best protection. The leather models have worked best for me; they are still troublesome, but they will hold up and you won't lose too many if you secure them with athletic tape. Avoid the nylon + cordura dog booties, the rocks will destroy them in a morning. I know. I also recommend bringing some spares. On more than one occasion, my chessie Bones has lost booties. In desperation, I have taped my own socks reinforced with tape onto his feet to no avail. If you don't want your dog to leave behind bloody tracks in the snow, bring booties AND spares. There are compounds that you can buy to treat your dog's pads to make them tougher. The old hunter, who took me on my first chukar hunt (we weren't old then! ), claims they work well on his German Shorthairs, but I have had only limited success with the two brands that I've tried. They do help to toughen and heal a dog's pads, but are far from a prevention or cure of pad problems. I am not a dog training expert. I have read a few books and practiced on my own dogs. I do know one thing, a well-trained gun dog is a pleasure to hunt over. One that runs ahead and busts birds out of gun range is not. Spend the necessary time to train your own dog, pay a professional to do it for you or wish that you had. I think it is important to train your dog to whistle and hand signals, especially directionals, in addition to verbal commands. You can control your dog at long distances with a whistle and hand signals let you do it quietly. Train your retriever to perform blind retrieves; you'll bring more birds to the bag and save yourself a lot of climbing. If you can teach your pointer to do a blind retrieve, you're a better trainer than I am. Chukar hunting is very, very strenuous for man and dog alike. If you've never hunted them, I can't stress this enough. Have I mentioned yet that chukar hunting is hard? It is! If your Lab spends all summer lying around in the shade getting fat, he won't last very long running up and down the canyons. Worse, your hunting partner could borrow a quote from Steve, of Nampa Idaho: "[insert your name] has a useless, out of shape yellow lab that adds zero value to an upland hunt." It will take more than a couple of dog walks to get your four-legged friend ready. Your chukar dog needs to exercise year around, just like you do. I have a lot of experience hunting chukars with retrievers. I have hunted over my Chesapeake Bay Retriever, Bones, for more than a decade. You won't see many chessies out in the rocks, but they are out there. Kurt, from Reno NV, sent me a picture of his chukin' chessie and I met Dave's chessie Murphy, also from Nampa, on a recent hunting trip. I have much less experience with pointers. In the fall of 2002, I got my first pointer, a two year old started German Shorthaired Pointer named Annie. Annie is not the first pointer I've hunted chukar with, but she is the first one I've had the pleasure of owning. One difference was immediately apparent. Annie has huge tough "clodhopper" paws that she uses to scrape the skin off the top of my feet every morning as soon as I put them on the floor. She doesn't do it on purpose; she just stands on top of my feet with her rough, callous paws. These big gnarly feet are ideally suited to chukar hunting. Her paws hold up better to a weekend of chukar hunting without booties than Bones' did with booties. AND she covers double the ground than he did in his prime. All things considered, I think that pointers are better suited to hunting chukars than retrievers. Their feet hold up better, they cover more ground and, assuming the birds cooperate, you may be presented with better shooting opportunities. However, especially on doubles, expect to lose a chukar occasionally that a retriever would have brought to hand. I realize I'm playing with fire here. Hunters are passionate, and often bias, about their chosen breed of gun dog. I understand that pointers and retrievers alike can be indispensable for locating downed birds; pointer men will regale all who will listen how "versatile" their pointer is and the amazing retrieves their dogs have performed. Retriever men will continue to teach their labs to point. Retrievers have pointing instincts. My chessie pointed quite a few times without any training or encouragement and NEVER had a nonproductive point. But come on! Be objective. Pointers are the best at pointing and retrievers are the best at retrieving. But which breed is best for chukar hunting? My Chesapeake Bay Retriever is the best dog I've ever seen hunt chukar. There ain't no Bones about it. All kidding aside, there isn't a best chukar dog. If you want to join the band wagon, I've seen shorthairs and labs used the most (from the pointing and flushing breeds respectively). However, you can bag chukar with any decent well-trained dog from any of the sporting breeds.